The seated row is one of the most effective exercises for targeting your back muscles. A study in the June 2004 issue of the journal “Dynamic Medicine” concluded that the seated row is superior to both wide grip and reverse grip pulldowns for activating the middle trapezius and rhomboid muscles. Because this exercise is a compound exercise, involving more than one joint, it also activates several other muscles as well. The seated row is considered a general back exercise because it hits so many back muscles. The main muscles you will activate include your erector spinae in your lower back, your middle and lower trapezius in your upper back, your rhomboids and latissimus dorsi in your middle back and your teres major in your outer back. You will also strengthen shoulder muscles, including the posterior deltoids, infraspinatus and teres minor, your brachialis and brachioradialis in your arms and your pectoralis major, sternal head or lower chest muscles. As you perform the seated row, you need to use several secondary muscles as stabilizers. 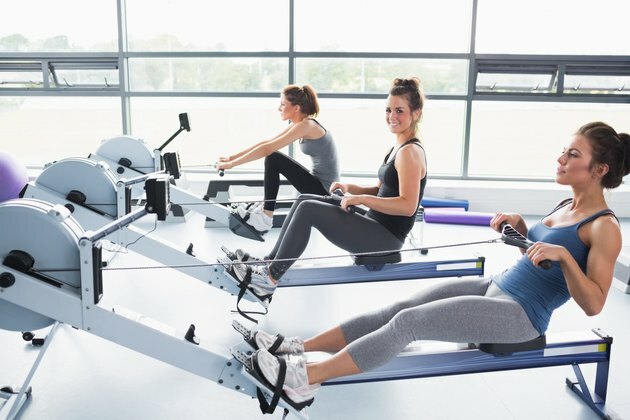 Your biceps and the long head of your triceps, both found in your upper arms, serve as dynamic stabilizers, meaning they help stabilize the shoulder as you row. Your hamstrings, your gluteus maximus and your adductor magnus in your lower body serve as stabilizers in this exercise. The row strengthens these muscles to a lesser degree as they stay contracted through the movement to help maintain your posture. Set the right weight on the seated row machine and attach a close grip bar or V-bar to the cable. Sit on the machine bench with your knees slightly bent and your feet against the footrest. Grasp the bar with a neutral grip so that your palms are facing each other. Keep your back straight and your chest forward throughout the exercise. Exhale, pull your shoulders back and bend your elbows until you pull the bar close to your lower chest. Inhale and slowly bring your shoulders forward, flex your back and extend your arms until the bar is close to your feet. Repeat for your desired reps. If you don’t have a seated row machine, you can do several other row exercises that will target the same muscles. You can use dumbbells, a barbell or kettlebells to perform bent-over rows. If you have access to a pulley machine you can also do one-hand standing rows. You can also try the exercise without weights by performing inverted rows using a fixed horizontal bar. Each exercise alternative will target your muscles from a slightly different angle. Change up your exercises periodically to keep your muscles challenged and continue your strength gains.